Good day, sir, I believe the title speaks for itself. I say good day! To translate: we had a Sunday Dinner (on a Monday), and it seemed like dumplings would be a nice thing to eat and make. First, a quick note on preparing the ingredients: Every solid ingredient should be finely diced, and mostly drained of any water, so it doesn’t make the wrapper mushy. Take the diced napa cabbage, and add a little bit of salt (to dehydrate it). I also put a few layers of paper towels at the bottom of the bowl that contained the cabbage, to help collect the water. Add the diced green onions, garlic, ginger and shallots, and set it aside, to let the water drain. In a separate bowl, add the sesame oil and soy sauce to the ground pork. Then, after dumping out any excess water, add the cabbage mixture, with a little bit of sugar, and use your hands to mix it all together. Add a little bit of salt and pepper, as desired. Note: It was the same process with the shrimp dumplings (except I didn’t add sugar – but that probably would’ve been okay too – and I did add a little bit of cooking wine). To wrap the dumplings, have a bowl of water ready, the plate or other surface that you’ll be using to prepare the dumplings, as well as the plate or container that the finished dumplings will go onto. Sprinkle some flour onto the preparation surface and the finished product container, so the dumplings don’t stick together. Place a wrapper on the preparation surface. Put a little bit of the filling in the center (not too much, because you don’t want to overload the dumpling and cause it to fall apart). Dip your finger into the bowl of water, and trace a circle around the edges of the wrapper on the side that is facing you. Fold the dumpling wrapper in half, and then pinch the edges closed. I boiled the dumplings, using the “add water and bring to a boil three times” method. I also tried pan-frying after boiling them, but they contained too much water. Perhaps I will drain the dumplings a little bit after boiling before attempting to pan-fry them next time. In any case, both the pork and shrimp dumplings were delicious (the pork dumplings stayed together though) – particularly with the usual Chinese dipping sauce (soy sauce, sesame oil, rice vinegar or red wine vinegar, garlic, shallots). 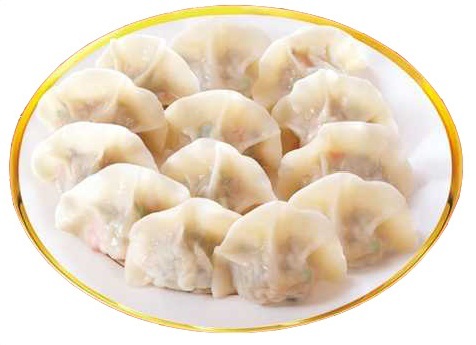 For any uncooked dumplings, they should be frozen on a flat surface (perhaps sprinkled with a little more flour to prevent sticking), after which they can be mixed together, say in a plastic bag. This entry was posted in Appetizer, Chinese, Main Dish, Recipes and tagged Dumplings, Pork, Shrimp. Bookmark the permalink.